Alan Sugar. Duncan Bannatyne. Michelle Mone. Tom Hunter. Sir Alex Ferguson? To some, the former Aberdeen and Manchester United team boss' name might seem incongruous on a list of business gurus. But many top money men - and women - have been flocking to hear the 73-year-old preach his version of "the secret" in talks to promote the launch of 'Leading', a new book that has already ignited debate because of his assertion that he only ever managed four truly world-class players. Former Aberdeen midfielder John McMaster is not surprised his fellow Scot has gathered so many followers in the business world and he himself remains an enthusiastic disciple of the son of Govan. So much so that McMaster, whose passing prowess helped Ferguson's Dons dominate Scottish football and lift the European Cup-Winners Cup, is himself revealing what he believes is the Ferguson formula for success in talks organised for both budding and established entrepreneurs by business advisors Route to Employment. "When I was up at Glasgow University, there was one guy who asked me in one word to sum up Sir Alex Ferguson and I thought - winner!" said the 60-year-old with evangelical zeal about Ferguson's career, which garnered 50 cups and trophies. The trail of glory that followed Ferguson from his time at East Stirlingshire, St Mirren, Pittodrie, the Scotland national team then Old Trafford impressed Harvard Business School enough to appoint the Glaswegian to a long-term teaching position in executive education and build a case study around his illustrious career. In Leading, Sir Alex and co-writer Sir Michael Moritz, the investor and author, examine the wider leadership lessons that can be learned from the way he dealt with everything from tactics to teamwork, hiring to firing, from dealing with the boardroom to responding to failure. A BBC One documentary is scheduled for later this year in which the BBC's Nick Robinson will suggest that Ferguson was the mastermind behind one of Britain's leading brands and that the way Manchester United blossomed into a huge global force under his leadership is unique in the history of world football. 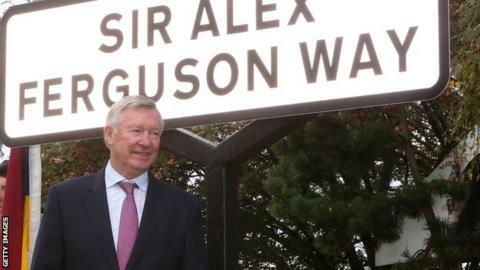 In the build-up to the programme being made, Ferguson himself said: "Figuring out what it takes to win trophies with a round ball differs from the challenges facing the leaders of companies like BP, Marks and Spencer, Vodafone or Apple, or the people who run large hospitals, universities or global charities. "Yet there are traits that apply to all winners and to organisations whose leaders aspire to win." In his latest BBC Sport interview, Ferguson laughed off the public perception of him as a touchline "monster" but admitted that, as a fresh young manager, he was "ferocious and my anger was obvious" before that dressing-room manner was tempered by experience. McMaster too is quick to correct those who believe that the infamous blast of angry verbals, 'the hairdryer treatment', is all that propelled his fellow Scot to success as a manager of footballers. "He was a lot more than that," he said as Ferguson prepared to take part in question and answer sessions with BBC radio host Nicky Campbell at Glasgow Royal Concert Hall on Monday and Aberdeen Music Hall on Thursday. "You hear stories of all managers being mad. They've got to have that bit of madness in them to be a manager, but I think it is something that he has been tarnished with that he shouldn't have. "He never really exploded a lot. When he did, you didn't want to be the player that was getting it - he's had his moments and I've seen a few - but once I started learning more about the man, he was brilliant towards me as a person. "I had suffered a few injuries and the other side of Fergie came out there because he made sure that my wife and my kids were fine and also I was fine mentally - and he looked after us financially. "He kept us part of the club as well because he also encouraged me to learn coaching." McMaster points out that Ferguson encouraged all his players not only to perform on the pitch but to become students of football and "give something back" to the sport. "He more or less told us to understand the game, to do the coaching badges, and I would say 80% of that Aberdeen team and 80% of every team he's managed has probably done coaching at some level," he said. "I don't think any manager has had that kind of impact apart from Bill Shankly. He was quite similar and has helped a lot of ex-players get jobs." Gordon Strachan, Mark Hughes, Alex McLeish... the list of those who played under Ferguson and went on to be managers in their own right stretches beyond 30 and continues to grow. McMaster reveals a football manager who pre-dated and exemplified the modern business buzzword of networking. "Any time you've got a problem or any time you want to see him, he's always got time for you," he said. "He's always open to giving advice. He's never shut that door." It is a similar picture of Ferguson that is painted by Yeovil Town manager Paul Sturrock in his own new book, "Luggy". Sturrock recalls receiving a phone call at Ninewells Hospital after hyper-ventilating in the dugout while manager of Dundee United in the 1990s. It was Ferguson offering him sage advice, telling him to get rid of under-performing players instead of trying to change their mentality. Ferguson's words of advice have also helped the fledgling John McMaster Soccer Camp, with Stewart Kennedy, Peter Weir and Neale Cooper joining their former Dons team-mate in planning a month-long trip to Houston, Texas, in June to coach potential stars of the future. McMaster has in recent years persuaded Swansea City to invest in the burgeoning talents of Stephen Kingsley, Jay Fulton and Botti Biabi from Falkirk and Adam King from Hearts in his role of club scout and thinks Ferguson's enthusiasm for developing youths has influenced many such clubs. With a limited transfer budget at Pittodrie, Ferguson expanded Aberdeen's scouting network to previously untapped corners of the country and promoted his own youths into the first team - a strategy he repeated at Old Trafford. "He was terrific with kids," recalled McMaster. "I remember we were in the dressing room and there were about 14-15 youth lads and he knew every one of their names - and he knew the mums and the dads. That's impressive. "He had contact with everything at the club. How he did it, I don't know. It was non-stop football and the man must have slept for about four hours." Nobody survives as long as Ferguson did at the top of football without a touch of natural tactical genius. McMaster, though, says this was bolstered by a work ethic bordering on obsession and an exhaustive attention to detail when scouting potential signings - and opponents. "Everybody's got this image of a big, growling maniac," he said. "He had them days but he respected players and they respected him and they knew that, whenever he went on a rant, assistant Archie Knox would be behind him laughing. "He wouldn't see that as his hair's all up and the eyes are coming out. "But he had time for everybody. He kept the players happy, kept the physios happy, he kept the chairman happy. He had this unique thing. "It was the best times of our lives under him at Aberdeen and we should be thankful that he was there to lead us. "A lot of people said he was a bully, but he's not a bully - he's a winner."